In your Docebo LMS, you can manage user levels and user statuses in order to better regulate registration, access to certain features, responsibilities, and maintenance of your platform. Let’s take a look at both user levels and user statuses. There are three user levels within your Docebo LMS: Users, Power Users, and Superadmins, but all users in a platform will use the same login portal. The majority of people who access your LMS will likely be users. 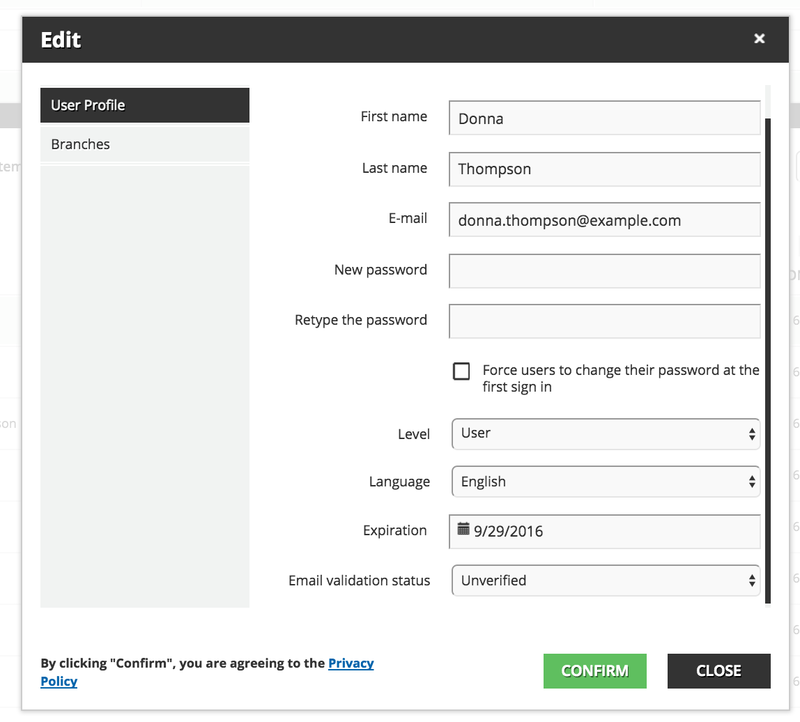 A user is a level that has basic permissions in the LMS. 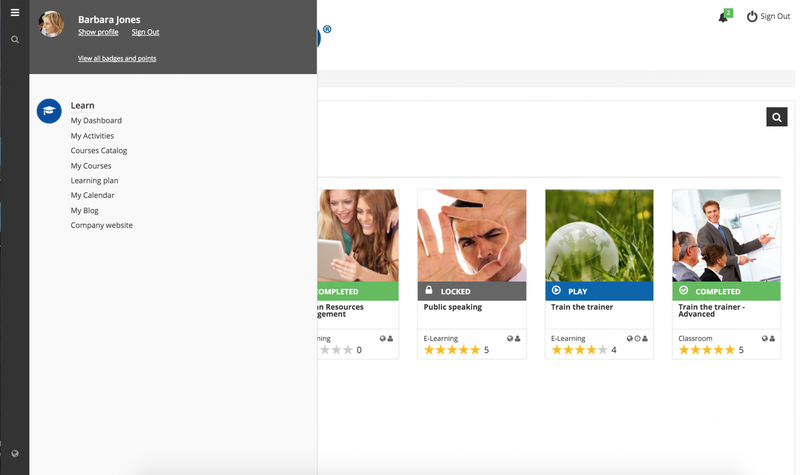 They are able to view training material and are unable to manage the LMS functionality. 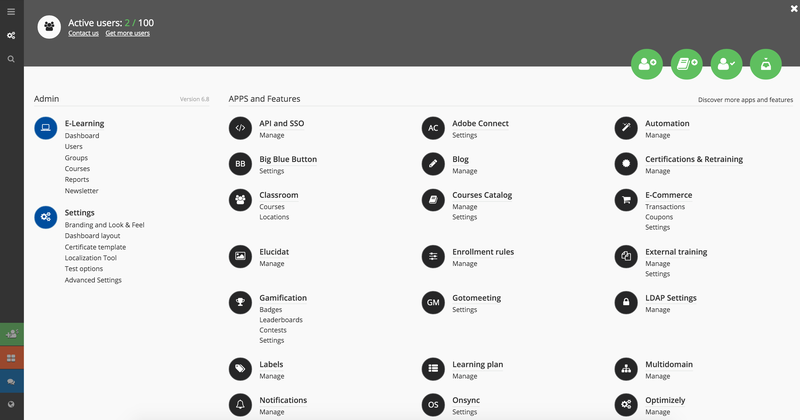 When a user logs into the platform, they are presented with a limited set of menu options. Superadmins are able to manage every aspect of the platform. They will have visibility to all apps, features, and settings. There is no way to limit a Superadmin’s permissions within the system. They are able to access any area of the platform by scrolling their mouses over the gears icon in the left sidebar, which grants them access to the Admin Menu. You likely will have only one (or a few) Superadmin(s). A third user level, Power User, is available when the Power User app is activated in the platform. 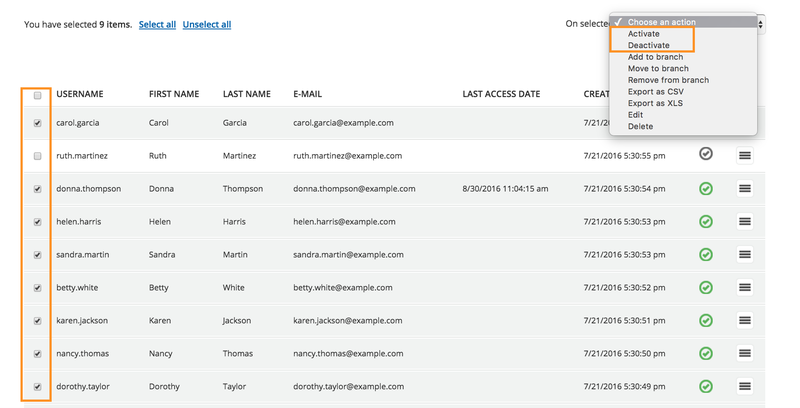 Power Users can be assigned a specific set of Admin permissions that they can use for certain users, courses, catalogs, and locations. However, there are some limits as to which responsibilities can be assigned to Power Users. For more information on how to manage Power Users, please refer to the corresponding manual in Docebo’s Knowledge Base. The graphic below outlines which permissions are visible and configurable by each of the user levels. Active. These are users that are activated in the platform, and have accessed at least one course or training material. They are marked with a green check mark in their rows in the main users list. Activated. These are users that have access to the platform, but have not accessed any courses or training materials. They are marked with a green check mark in their rows in the main users list. Deactivated. These are users that no longer have access to the platform. If they try to access the platform, they will receive an error message on the login page, and will need to contact the Superadmin. Deactivated users are manually deactivated by the Superadmin, and the deactivation is done immediately, unless the Superadmin chooses to expire the user. They are marked with a grey check mark in their rows in the main users list. Even if the user is deactivated, the user’s data is not erased by the platform. Expired. These are users that no longer have access to the platform because the Superadmin set a specific expiration date for their activated user status. If they try to access the platform, they will receive an error message on the login page, and will need to contact the Superadmin. They are marked with a grey check mark in their rows in the main users list. Even if the user is expired, the user’s data is not erased by the platform. Access the Admin Menu by scrolling your mouse over the gears icon in the left sidebar. Then, in the E-Learning section, press the Users item to redirect to the User Management page. On the main Users page, you will see an action bar at the top, and a list of all of the registered users in the bottom of the page. Find a user in the list, then find the check mark in the user’s row. If the check mark is green, then the user is activated. If the check mark is grey, then the user is deactivated. You can press the check mark, switching it from green to grey, to deactivate a user, and vice-versa. As the Superadmin, there are two ways to activate and deactivate multiple users at one time. The first way to do so is by flagging the check boxes in the user rows for the users that you want to activate or deactivate, then selecting Activate or Deactivate from the dropdown menu on the right side of the page, as shown in the picture below. You can also massively activate or deactivate users via CSV. Please refer to this manual to learn how to do so. You can also set the expiration date of a user, so they will become a deactivate user after a certain date. To set the expiration date, press the menu icon in the user’s row in the user list, then select the Edit item from the dropdown menu. In the edit menu for the user, find the Expiration field, then click on the calendar icon to select the expiration date from the calendar. Press Confirm at the bottom of the menu when finished.